Word in the Hand™, located in Menlo Park, California, USA, has over 20 years of software development expertise and real-world experience in bringing dictionary, phrasebook, and other linguistic software products to market. 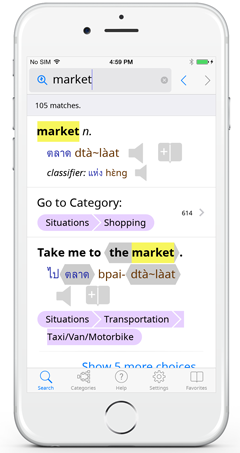 Since 2001, we have partnered with Paiboon Publishing, the world's leading producer of South-East Asian language learning materials, to produce a series of cross-platform dictionary and phrasebook apps for Thai and Chinese (currently running on Windows, iOS and Android), with many more languages and products to come. Word in the Hand also designed a complete multi-user network-based dictionary production database editing, proofing, and typesetting system that Paiboon Publishing used to produce the best and largest dictionary dataset for foreigners learning Thai. We then used this system to produce a printed dictionary and apps on four different platforms. If you are interested in producing dictionary or phrasebook apps for your own dataset in any language, or even looking for our help in creating your own dataset from scratch, please see our custom apps page. If you are interested in earning commission by selling our industry-leading Thai and Chinese products in their respective products, be sure to read our sales rep page.